All opinions are my own and not edited by the sponsor. My youngest starts preschool tomorrow. It is a big day in our house and I am a little worried about how it will go. Last year, the entire first month was a struggle. Starting over with a new class, a new teacher, and new friends will be a challenge. Add that to the fact that I also have a child in elementary school, middle school, AND high school and there isn't much room in our schedule for surprises. That is where SoCozy comes in. Everyone knows the dread of the note sent home from school that starts, "We are writing to inform you that there is a confirmed case of lice in your child's classroom." Knock on wood, we have never brought any unwanted visitors home from school, but instead of pushing our luck we are going to put the odds in our favor with boo! 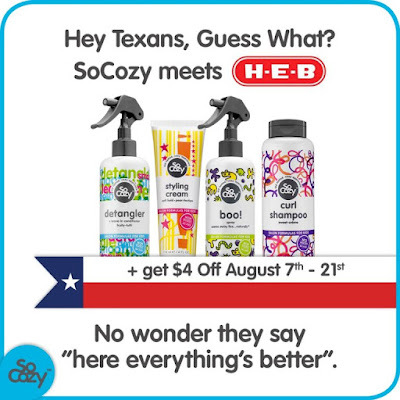 shampoo and leave-in spray from SoCozy. It uses a mix of natural ingredients like peppermint, rosemary, and lavender to scare away lice! 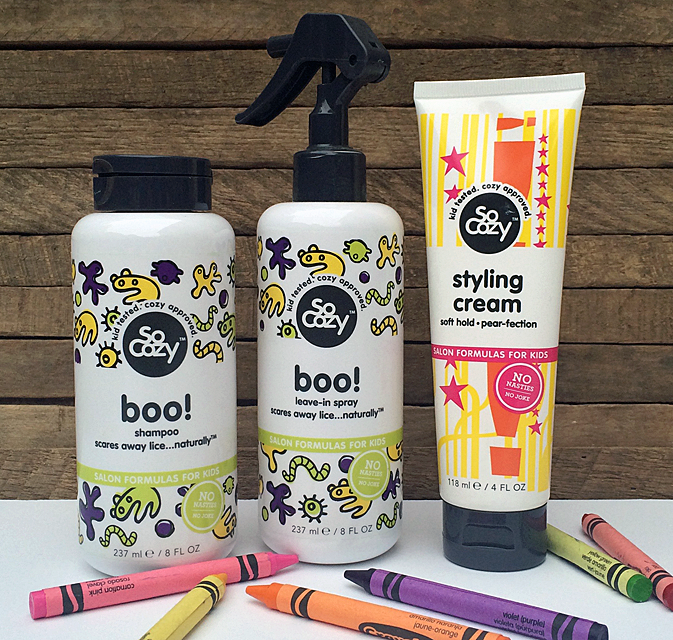 So Cozy is a line of salon formulas that were designed for the unique hair need of kids between the ages of 2 and 12. They are non-toxic and made without parabens, formaldehyde, sulfates, phthalates, synthetic color, propylene glycol. No 'nasty stuff' as they like to say! They are also free of alcohol, gluten, wheat, peanuts and tree nuts. Stuff I didn't even realize might be in shampoos! And there is something for everyone, like Cinch Detangler, Boing Curl Shampoo, and Behave Styling Cream, which comes in handy when trying to tame the hair of a 3-year-old with a wicked cowlick! 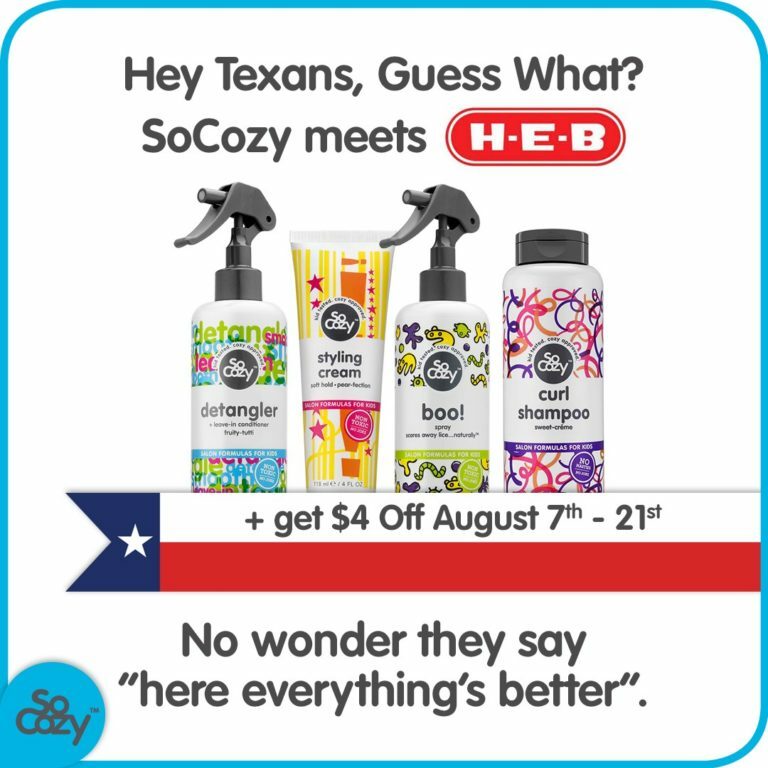 Even better, SoCozy products are now available at HEB, so I can pick it up when I am out grocery shopping. No extra trip needed! Hopefully with the help of SoCozy we can make back to school as easy and un-scary as possible!